A study published Sept. 8 in Science magazine reveals that Sahara desert ants (Cataglyphis bicolor) can navigate to and from their colonies with solely their vision, not just by counting steps to calculate how much distance they’ve traveled. Scientists say the Saharan ants use “optic flow,” which is the apparent visual motion that you experience as you move through the world,” according to Centeye, a developer of compact vision systems for robotics and embedded platforms. It is like driving in a car and estimating distance and direction outside of the window. 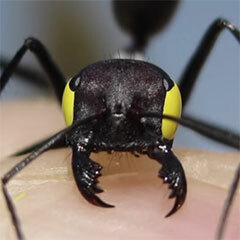 To conduct the study, researchers used “blindfolds” to cover the eyes of ants. The scientists were surprised by the findings, because interior workers that did not know how many steps they were away used just their sight to return. Prior to this study, it was thought that the ants of the Sahara Desert navigated mostly by counting their steps. “Researchers think these ants’ Saharan habitat is so hazardous that they evolved two separate mechanisms—step counting and optic flow—to cope,” Science says.